The following is the final report of Mars Desert Research Station (MDRS) Crew 161. A full review of this year's activity at the MDRS habitat will be presented at the 19th Annual International Mars Society Convention, scheduled to be held September 22-25, 2016 at the Catholic University of America in Washington, D.C. A call for papers for the 2016 convention has also been issued, with full details available on the Mars Society web site. Crew 161 (Team Skoltech) is a team of graduate students pursuing M.Sc degrees in space and energy tracks at Skolkovo Institute of Science and Technology situated in Moscow, Russia. All members have spent at least a semester doing research or course work at the Massachusetts Institute of Science and Technology (MIT), USA as part of our graduate studies. Each member brings different skills and specializations to the team, the goal of which is to experience life as an astronaut on Mars with limited resources while conducting scientific research on understanding Mars as a potential planet for human habitation. Research was organized along key expertise of individual crew members: science and engineering. The team came up with research projects to study the physical and chemical properties of the Martian regolith, study the growth of plants under different climatic conditions with varied soil samples and to build a lego-robotic arm to collect the regolith which would emphasize the use of 3D printed lego components on Mars for Rovers/Autonomous Robots with tele-operation capacities. Physical analysis was conducted on-site to understand the structure of the regolith in various depths and in various regions around the MDRS. The physical analysis, especially shear-capacitance measurements, also gives an insight on the design parameters necessary for the development of the robotic arm. Chemical Analysis was performed to check the presence of different organic salts in the soil with a view to understanding the best regions for plant growth and also to come up with requirements for fertilizers. The presence of different salts like nitrates, phosphates, magnesium, calcium carbonates was tested in different regions. Physical analysis was made in three different regions: the region with the highest shear capacitance was chosen for testing the robotic arm, the thinking being designing for the worst-case scenario guarantees robustness of the robotic arm in regions with lesser shear capacitance. Working at the MDRS gave us a better understanding of Mars and the complexities of space exploration: consider for example how complex it is to even fix a broken screw on Mars while in space suit in a region with a third of Earth’s gravity and high radiation. Apart from individual research work, engineering checks, managing the resources efficiently, we learnt to be prepared for anything “Just in Case” as astronaut Chris Hadfield puts it in his book “An Astronaut’s Guide to Life on Earth”. Spending time watching a blanket of millions of stars in the night sky made us crave for that amazing view of home from Mars. Being in isolation with limited resources made us also deal with individual psychological conditions. It was also a good opportunity to understand individual mentality and how to grow as a team. There were many situations where we had to come up with team decisions, motivate other crew members who were feeling low and keep the team spirit high. EVAs were great learning experiences: dressing up in space suits, wearing oxygen tanks, driving ATVs and performing on-site physical activities were real experience of an astronaut doing EVA. We learnt many safety procedures to be followed from every EVA mistakes. We learnt every day in the simulation. Having team meetings twice in a day, dividing tasks and sharing responsibilities, going on EVA and conducting research, communicating with habcom on radio, reporting our activities to Capcom, getting approvals for our every activity were all part of our everyday activity. We also spent time in team building activities too. We bonded over board games in the evening, reminisced over memories from school, shared our varied multicultural experiences and broadened our world views through thought-provoking conversations around science, faith, world peace and the future of space explorations. “A dream is a step away” is what I have considered as my life’s motto. My dream to become an Astronaut led me to study space science, work on satellites and pursue a career in the space sector. As a first step in achieving my dream of going to space, taking part in the simulation at MDRS has given me a great experience and exposure to the life of an astronaut outside of our home planet. As crew commander, I went through many critical situations demanding sharp decision-making skills. I realized how vital it is to take the right decisions while leading a team in an extremely hostile environment where any small error can be fatal and jeopardize the mission aims. Every EVA we had taught me how to take decision based on priorities and consider safety first. Performing physical analysis to figure out the best design parameters of our robotic arm according to the shear capacitance of the soil and performing chemical analysis to figure out the organic content in the soil for plant growth helped me relate this to Mars and come up with the best approaches to analysis and instrument requirements for human exploration of Mars. The challenge for space suit design became also very obvious to me, as I performed routine activities like digging, writing, lifting etc. in a space suit with great difficulties. As an electronics engineer, spending 14 Sols at MDRS nudged me to think about the present and future technologies and infrastructure that has to be ready for future human habitation on Mars which I would consider working on, back at Skoltech. Spending two weeks in this environment made me more skilled in tackling different mindsets of human and understanding my own ability to survive on Mars tackling the psychological conditions. I am happy that I could manage to take right decisions with minimal errors, keep the crew spirit high whenever it was necessary. Looking forward to improving myself with all the lessons learnt and to be ready, “Just in Case” as Chris Hadfield said in “An Astronaut’s guide to life on Earth”. As commander of Crew 161, it has been a great honor to lead this team of highly-talented individuals to push the boundaries of our understanding of Mars. As a person, I learnt to lead by example, listen to all crew members and gauge every decision as per what’s best for the team. I am glad that our mission has been hugely successful: we formed life-long friendships and made some important progress with our research projects. Experience is the best teacher. You could read about things in papers, listen during lectures, complete numerous problem sets, but you would never fully understand until you experience it yourself. MDRS gave me that precious opportunity to try on the role of an astronaut living on Mars. These 14 Sols taught me to listen to crew dynamics, live in a 'tin can' with very limited resources, appreciate things that seemed to be ‘a given’ on Earth. These 14 Sols taught me to put on EVA-suit without external help, complete almost exquisite workmanship wearing huge gloves and looking through the helmet. It is amazing how humans adapt to a new environment and how fast we learn. As the Crew Health and Safety Officer, I was challenged several times. For the crew operational safety, I applied human factors engineering to develop procedures and checklists for the most crucial activities such as EVA, engineering checks, walks to the observatory etc. One of my tasks for the mission, as the Crew Biologist, was to see how plants grow in different combinations of Earth and Mars soil. I brought small amounts of Earth soil and a bunch of bean seeds with me. 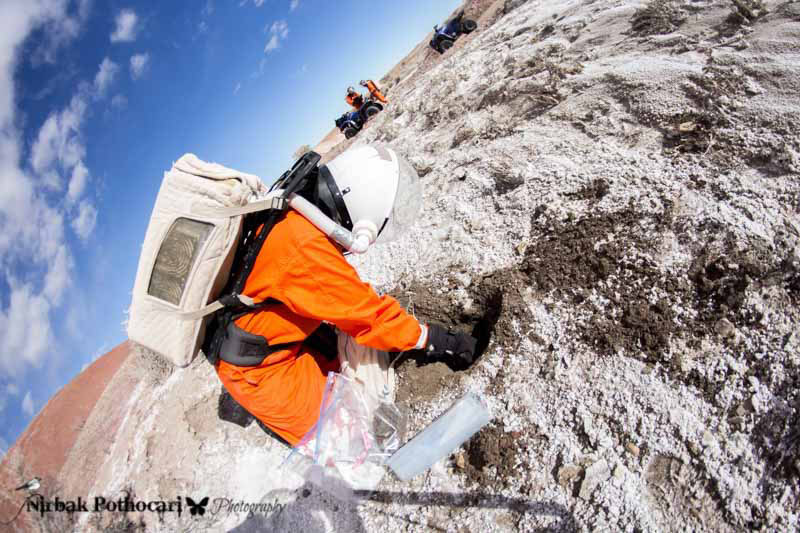 Mars soil was collected from different regions during EVAs. I also planted radish that was left from the previous Crew. The plants showed growth in particular combinations of Earth and Mars soils. Overall it was definitely one of the greatest learning experiences with an opportunity to apply knowledge and explore my own capabilities. I’m very thankful to my most amazing Crew and Mission Support that helped to easily overcome all the challenges and made my stay on the Red Planet unforgettable. During the mission, I increased my astronomy skills, tried new techniques in astrophotography. I accomplished my plans only partly: caught a comet, made a picture of the Moon, but I was not able to make a series of pictures for them to see changes and also I was not able to record occultation of Aldebaran by the Moon because of the weather. It teaches to plan astronomical observations more carefully even in the most promising place in terms of the weather. Also, I noticed some psychological effects: first of all, I was extremely scared being alone in the observatory if the crew was sleeping (it was my personal experiment). But I know cases when men were not scared at all, it could be a gender feature. But if we extrapolate our life to Martian life, anyone can be scared and it would be unsafe. So, according to the rules if one person is outside of the Hab, another one should be online in the Hab. But still, for the first couple of times, I was scared to be alone outside. Secondly, observations during the evenings make it impossible for me to participate in some of the teambuilding activities, I had to choose: work and go to sleep early or to participate and go to sleep very late. Sleeping not enough amount of hours influences on the team work in the next day. As part of safety rules, we had one crew member awake on radio in the Hab while I worked in the observatory. It was possible to manage during two weeks, but during a longer mission, the astronomer’s schedule has to be organized in another way: shifts or one observation night per week with day-off the next day. All in all, MDRS was a great experience for me. Looking back at an amazing two weeks at the MDRS, I am absolutely grateful for the experience I have had here. MDRS is not just a unique place geographically, its SIM environment makes you feel like a Neil Armstrong or Yuri Gagarin pushing the boundaries of space travel. As a chemical engineer, I supported our crew commander’s work on soil chemical analysis, contributing to the study of the MDRS area regolith. I also took on the role of Executive Officer, helping to steer the team towards a common goal for our mission. We took our SIM very seriously, worked hard on safety precautions and keeping the team spirit high in order to accomplish our research aims. On the third day, I started feeling the lethargy of isolation that comes with extended stay in a confined space. Limited communications with friends and family meant I had more time to think about the things I cherish most about them. It was a wonderful experience of quiet introspection. As the crew journalist, I enjoyed going on EVAs and covering research projects being carried out for our daily reports. I learnt a lot from the other crew members: assembling a robot from our crew engineer, making pancakes and tending for plants from crew biologist, the wonders of astrophotography from our crew astronomer and lots of interpersonal skills that cannot be quantified through leadership with our crew commander. I thoroughly enjoyed my time here at MDRS and will be taking home with me a myriad of stories about Mars, our crew and our research projects. Life in outer space is always a fascinating matter to think about. My time at MDRS was incredibly productive. I joined the team a week late. A typical day begins around 8 am with a short physical warm-up and a good space breakfast. After engineering checks, I participated in morning meetings where our team discussed daily plans. The best part of MDRS for me was going for EVA with space suit with limited access to mobility and joining our crew astronomer for night sky views. Working with another crew engineer, I worked on our research project “Red ARM 1”, which is a robotic arm developed to dig the surface of hard Martian surface and collect the regolith from the surface. We successfully tested our robot on EVA. Spending time with different crew members, discussing and understanding each other’s points of view on different topics, has been a great input to my personal worldview. This is an experience I will never forget. During this rotation I had a pleasure to work as a crew engineer. I would not say that we faced many severe engineering challenges during the mission, however, there are a few interesting things that I want to mention. First, I successfully completed my robotic arm research project. We assembled the rover from scratch and coded it to be controlled from a laptop. Though there were many issues: was not able to connect with a laptop, the robot once did not respond to commands and it was really tough to repair it on site, this robot was capable to drive on the rough Martian terrain and collect soil for primary chemical analysis. It was great experience for me, when I once again tested my “emergency engineering with limited resources and time” skills. Second, I had to keep a sharp eye on all engineering systems. All together we were able to optimize our water, gas and Internet consumption during the whole mission. I believe it was our achievement as a team. Also, fortunately, we did not have any serious accidents. This is again thankfully to my team that helped me keep essential systems operational. This trip to Mars was one of the most exciting and intense for me. I understood, that even though space exploration is very romantic, it is a very difficult job in the first place. However, I’m eager to continue pushing the limit and maybe one day become a real Martian engineer.